Comm Eye Health Vol. 30 No. 97 2017 pp 19. Published online 12 May 2017. A 2-year-old boy is brought by his mother because of a “white shadow” in his eye. The mother says that she first noticed it 4 weeks ago. There is no history of significant eye problems in either parent or in the two other siblings. The eyelids and orbits appear normal. The right eye is normal. 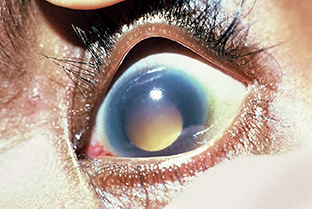 The left eye has a white yellow reflex in the pupil. There is no obvious squint.